Since I was a little girl, Africa fascinated me. The animals, the landscape, the people and the culture drew me in. I would read books such as Out of Africa by Karen Blixen, Poisonwood Bible by Barbara Kingsolver and articles by Dian Fossey. If there was a documentary on TV, I had to watch it. My day dreams were always about living and working in a small village in the middle of the jungles. Once I graduated as an RN (registered nurse) my dreams included caring for the sick. 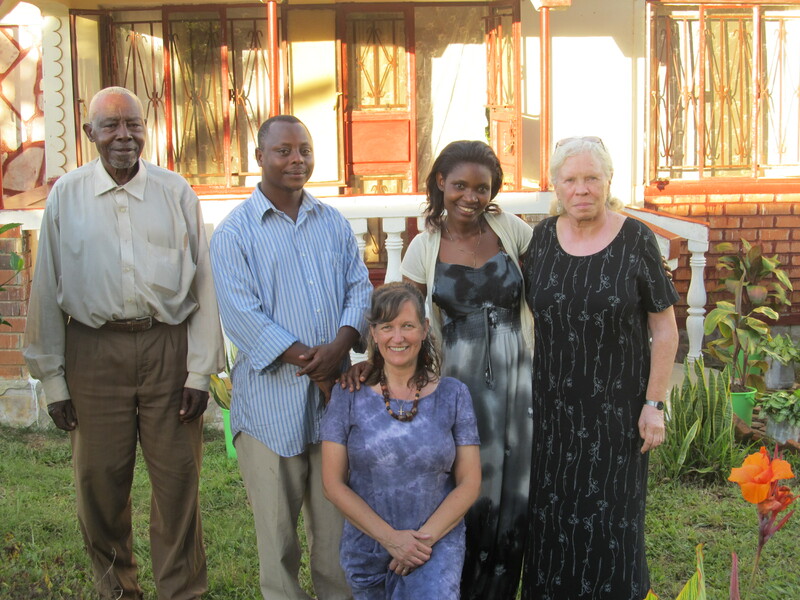 Of course these were only dreams until I received information that my old dear friend Willie Mitchell and her husband, Art and their three children had been commissioned to open up a new program for Mission Aviation Fellowship in Bukavu, Zaire. The letter from Willie describing the massive amount of effort it was going to take to start up this new program. There was just too much work for two people. So, I offered to come out for 6 weeks if I could get my vacation and a small leave of absence for my job. But my offer was rejected. Willie was very clear, “You will only just arrive, settle in and it will be time to leave”. With that answer, I realized that I would have to quit my job if I wanted to go at all. Suddenly, the answer seemed so clear. How could I say No. Of course, I would go. It was an opportunity of a lifetime. I was overjoyed at the freedom I had. Now, I would sell everything I owned including my car and pack up the rest and move it into my parents basement. I was flying high with hundreds of things to do from setting a departure date, booking airline tickets, getting a new passport, sells and or packing when I received a call asking if Willie’s 72 year old mother could accompany me. Why not! We would be traveling from Vancouver, B.C. to Heathrow, England and then on to Nairobi, Kenya. My pastor suggested we contact MAF to let them know of my plans. His research revealed that Zaire was the poorest country in the world, with no international currency, very little infrastructure, limited local and international telecommunication. and run by the dictator Mobutu Sese Seko. If a coup occurred he wanted to make sure I got out the country with the Mitchell family. My friends and colleagues understood my desire to go to Africa but wished my friends were not living in Zaire. As they saw it, I was giving up my whole life; I could possibly die of snake bite, or malaria or eaten by cannibals. They treated me royally with dinners out and daily sweets. But they wanted to do something special. Unfortunately, nothing came to mind until one night I had a dream of driving in a Mercedes Benz. I left without going for a ride in a Mercedes Benz. It was about 2 months before out departure, when I received a very surprising phone call from two executives from MAF and Hope International Development Agency. They wanted to meet me and discuss my trip to Zaire. We discuss many topics but somehow their purpose remained a mystery to me. Finally, when I was finishing my last cup of coffee, they asked the question. “Did I have a boyfriend or mortgage or some financial responsibility that required me to return to Canada after 6 months? What were they asking? What were they saying? Was this the true purpose of the meeting? One of them went on to say they were also on the board of a missionary agency out of Chicago called Paul Carlson Medical Program. They had a large rural hospital in northern Zaire called Imeloko. It was staffed by a number of American and Canadian doctors and nurses. Would I be interested in working for them in the outreach program for a year after my 6 month visit with my friends. They would pay for my fight from Bukavu to Imeloko, give me a small monthly salary which should pay for my food and other essentials plus pay for my flight back to Canada. During my time in Uganda, I had a birthday… I received this ditty for Margo on the advent of her 63rd birthday as a gift. It was my first poem written for me and about me. I remember laughing and crying. I still cry each time a read this truly amazing thoughtfulness. I want to thank each person who helped create this very precious gift which I would like to give life too… in this blog. Years ago, in 1980, my African adventure began with the opportunity to visit dear friends on their opening a new MAF (Mission Aviation Fellowship) program in the once known country of the Belgium Congo/ Zaire. I went for a six month visit and ended up staying almost 3 1/2 years. Some of my adventures during those years were included in this ditty for Margo. One day she decided that she had more to give. A move which perhaps the family did censure. He decided that her crops he did like. So with the sale proceeds he took a hike. To listen for what Father God told. You have spent enough time in Surrey. In hopes that there PJ would be. When into it our intrepid nurse did dance. Never had they met such a sorter. No longer could cleaners in the beds lie. Starting with J and of Biblical fame. This is not what we see. Into the mud pit she did sink. Moses and Namukiika were bent in half. Who made themselves at home in her underpants. She discovered the water in her tank was no more. Only to hit the floor with a bump. She hoped her limbs would retain some feeling. When her feet gave way and she landed on her bottom. Out of the engine billowed black smoke. So onto the sidewalk hastened the folk. Sending a shudder right down her spine. And hope that 64, you will see. And hope in the future no more accidents lurk. And think it keeps you in very good health. And in our minds, you’re no old fart. Over the years, I have found it difficult to say goodbye especially to people I love such as my brother, sister-in-law, and my niece. They live thousands of miles away from me. Each time I leave, I wonder if and when I will see them again. To save myself from the sharp jabbing pains in my heart, and groaning, I give a quick hug, said my goodbyes and walk away quickly before they can see me crying. It hurts too much……….. So, can I say goodbye to all the folks that I have come to love in Kibaale? In Uganda, the school year starts the first week in February. After three months of school, there is a 3 to 4 week break. Kibaale Community Centre has a party at the end of each term to celebrate the employees who had birthdays. On April 25, there was the staff fellowship. I waited to the last minute and asked for a few minutes to tell the staff what was happening with my “work permit” and to say my goodbyes. I was kept waiting for a few minutes and then very politely informed “NO!” I was surprised. A few minutes later, as I was still standing outside the building, Peter the director came out and told me that there was going to be a farewell party for me the next Thursday, May 2. Initially, I was surprised, pleased, thankful and then overwhelmed. I was not ready for a farewell party. I did not know how I was going to be able to sit ….stand….. talk…. or walk? Why should I be honoured? What had I done to deserve a party? That week was extremely emotional ….. I cried and laughed; I was happy and sad; I was glad and mad. That next Thursday was challenging. I had no idea what to expect. I was nervous, scared, excited and thankful. The dining hall was full when I was escorted in. I knew most of the people by name. It turned out to be a “roast”…. Many of the staff of Kibaale Community Centre came to the front and told a story of thanksgiving for help I provided. It was one of those “out of body experiences.” I could not believe they were talking about me. It all felt surreal. After the many speeches, Peter, Kibaale Community Centre Director came to the front and thanked me for all my work caring for the students, staff and community. I was given a framed “Certificate of Appreciation”….. WOW!!!!!!!! What a surprise. I cried…..
A few of my special friends did not come…. they told me later that it was just too difficult. Samalie was one and the other was David. I was invited to his home for an incredible dinner. I have included a picture taken that evening. I came to Kibaale because God told me that he had a job for me. I could not have done any of it without the support of the many folks in Canada and in the United States who prayed for me and encouraged me…. They deserve this recognition not me. I do not understand why I am going home…. I know God has a purpose but right now I cannot see it. Maybe I will never understand why! Nevertheless, it is time for me to leave. It is time for me to say goodbye to all the folks in Kibaale, who have encouraged me, supported me, prayed for me and befriended me. Their relationships have made Kibaale a very special place. It will always be part of me; a place I love. There are no perfect words to say how much I appreciate each one of these amazing people who gave me their time and friendship. Thanks to Samalie, David, Patricia, Ellen, Grace, Esther, Harriet, Peter, PJ, Moses, Amos, Ethan, Esther, Julia, Ellen, Mugabi, Margaret, Madre, Stella, Rose, Vincent, Christopher, Goreth, Eva, Allen, Rosebell, Pastor Eric, Peace, Dominic, Robert, Josephine, Patrick, Joseph, Steven, Jackson, and my two sponsored students Deus, and Benita. It is Friday and I am planning on leaving Saturday about noon. I do not want to say goodbye on Saturday because I am taking some visitors from Canada on a tour. I would like to say my goodbye in private. So on Friday morning I head to the clinic to say my farewells. They are busy and this makes it easier for me and maybe for them. I was not planning on going back unless I was needed. It was time for them to work together and run the clinic without me. Since I still had many things to do that Friday, I spent the time in my Kibaale home..……..but one by one staff and students came to say goodbye. It was an emotional day…. At about 5:30, Namuliika arrived. My presence was requested at the clinic. They had planned a farewell dinner with some of my favourite foods including Irish potatoes, cabbage, two kinds of greens, eggplant, pasta, goat, and rice. Asaph was the M.C. which he took it seriously. Once again, there were speeches from a number of the clinic staff thanking me for my support, encouragement, leadership and friendship. Samalie pulled out her camera and the fun began…. Everyone wanted their picture taken with me….. we got a little silly but why not? I want to thank the staff of the clinic for making it possible for me to do the job I was asked and requested to do. They are amazing and they do a great work….. So to Namuliika, Asaph, Mariam, Margret, Daniel, David T, David, Justine, Dativa, Prossy, Rovinsa, Susan, Claire and Christopher thanks for all your support and friendship. Also to Charles, Joyce and Noellena. I am in Zanzibar. I have been working on this blog for 5 days…. It is not perfect because it has been the hardest blog to write. How do you say goodbye to friends you love not knowing when you will see them again?????????? When I worked in Psychiatry, one of the questions we asked was “Who are you named after?” Were you named after a favourite aunt or uncle? Has the person changed over the years since your birth? What do you like and dislike about that person you are named after? Whether consciously or unconsciously, our name has some affect as to who we are!!!!! 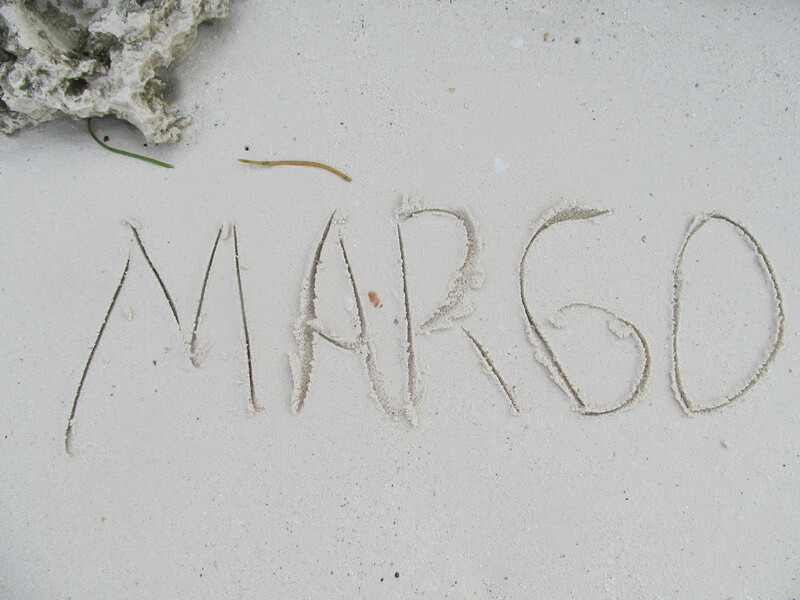 My name, Margo was chosen for me by my parents. They wanted a simple name which could not be altered, changed or shortened such as Elizabeth. They searched but did not find a suitable name. My godparents had just returned back from traveling in Europe. They were telling stories about their adventures. One stories was about an amazing travel agent in Paris called Margo. My parent fell in love with the name and I became Margo. It is because I am named after a travel agent that I love to travel and experience different cultures and people from across the world and that one of my favourite cities is Paris? It may have some affects subconsciously. It was not until I worked in Psychiatry that I was aware of this….. So, over the past 17 months, I have lived in the rural village of Kibaale. In the beginning before anyone knew my name or how to pronounce it, I was called Muzungu (the white person). Over the months, I was called My Muzungu, I become part of their community. I have been called Muzungu Margo, Aunty Margo, Sister Margo, Madame Margo, Jajja (grandmother or wise person) Margo, my friend Margo, the Mother of the clinic and just recently Jajja of orphans. Will these names change who I am? I think to some degree the answer is YES….. The folks in Kibaale saw parts of me I have never even considered or been aware of. I guess to know oneself better or deeper or through the eyes of other people is a good thing. I am thankful for their insight. In the beginning, the village of Kibaale, the students and staff wondered who I was and why I was there. Yes, I was a Muzungu, I was the only white person for over 30 miles in any direction. I was in my 60s, a single woman never married; no children. All of this does not make sense in the Ugandan culture where children are what makes you who you are. I had come to help in the clinic. I was not coming to run Kibaale Community Centre. I was not a nurse, nor a doctor but a volunteer offering my services to help care for the sick students, staff and community members. I was not like other muzungu who had come to live in Kibaale. I was different… and I heard that comment over and over again. We are all unique… just like we all have different fingerprints, we are all individuals and not the same as anyone else. Now, in Kibaale I have many names…. but I am still me, Margo. In Canada and in the United States, many business are named after the family or someone in the family like Johnston & Johnston, or Sam’s cafe, or Jeffery and sons Auto parts. In Uganda, how business are name has confused me right from the very beginning. Let me give you a few example of some business and the name given it. I continue to have a chuckle over some of them. Each of these places of business wants you to come in. You know very little about the business from the name. The only way to truly know what the business is all about is to enter and check them out. I have discovered some wonderful places in spite of their name. It is not what is in a name that counts but who is behind the name? A business is only as good as the people who run it and care for it. How did you get the name? What do you think about your name? What does it say about who you are? It had been a crazy few days. I am on my way back to Kibaale…. I just returned from a vacation to Zanzibar hoping I could get a three months visitor’s visa which was denied because Immigration found the still valid special pass. My focus has been on my work permit; I have wondered why, pondered why and pray for it. So, I have to say I was surprised when I arrived at the gate and security told me Namuliika, the clinic’s comprehensive nurse was getting married. Her Introduction was going to be on April 5 and the wedding on April 6. That was just over 4 weeks away. In the meantime, I was going to be traveling to Kenya to visit an organization called “Free the Children”. If anyone had told me that my life in Africa was going to be busy and not slow, quiet and peaceful, I would not have believed them. It takes time, lots of time to resolve issues or to solve problems. It has all has to do with relationships. You build relationship; you solve problems. So, who was Namuliika getting married to? I had not heard about nor meet any significant person in her life. I had however suspected that there was someone special. Each time I entered her office she would be on her cell phone and say something like… “I will call you later” in a very sweet and caring voice. Samalie stopped me a few meters after I had entered the compound. She provided me with all the details…. 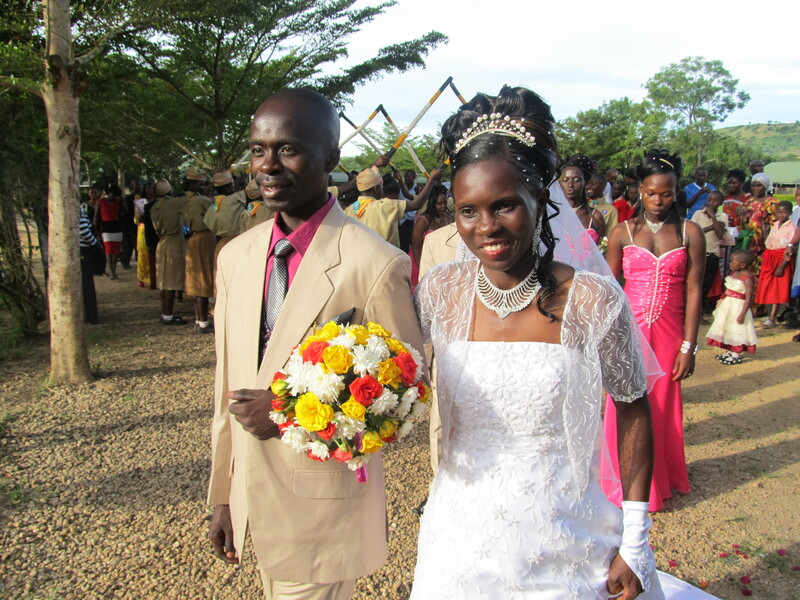 Namuliika was getting married to a Kibaale Primary teacher, named Nicholas. She met him at the clinic in June 2012 when he had Malaria. He thought he was cared for by an angel. It seemed that the only question she did not have the answer for was which side was I going to be on? Samalie suggested I would be on Namuliika’s side. I had no idea what that meant and knew the answer would present itself very soon. Later that afternoon, I went to the clinic to see how things were going and was introduced to Nicholas. He was not from the local Buganda tribe but from a tribe in the far north. Nevertheless, the Introduction was going to be in Masaka at the home of the bride. The wedding was not going to be in Nicholas’ village but rather in Kibaale. Pastor Eric, Kibaale Community Centre chaplain was going to marry them. The reception was going to be on the compound in the building called the Community Centre just across the field from my house. Over the next few days, numerous friends came to ask me if I had been informed as to which side I would attend the Introduction and wedding on. Since I did not understand what they were asking, I responded by saying I am on either side but here to support both of them. Finally, I asked Namuliika about this and she told me that I would be on her side. Problem solved or so I thought. An Introduction is a challenge to explain. It is just as important as the wedding. In fact, no Introduction equals no wedding. It is like the bride having a family wedding with all her family present. The wedding is for the groom to have all his family present. She plans the Introduction and he plans the wedding. Since travel and accommodation is expensive… I wonder if the reason for the two ceremonies is so that all family members on both sides can be present to see the happy couple and be part of the event. I have been two Introductions and no weddings. At both of the Introductions no English was spoken……. I watched and observed. It was like going to a three, four or five act play. Everyone knows the story line but the number of acts and persons participating change depending on what the bride’s family can afford. I came to realize that which side I would be on makes a difference as to what I was expected to do, contribute and wear. I reminded everyone that I was a Canadian first and not a Ugandan. Ellen came to my rescue, she came with me to Masaka, helped me pick out the material and find a seamstress to sew the outfit in time for the wedding. As for the Introduction, I was still unsure what I was expected to wear. With less than two weeks to the Introduction and a few days before I departed to Kenya, Nicholas arrived at my house to request that I be on his side. There was no time left to have another outfit made. He allowed me to wear one of the dresses I brought out from Canada. Now, I could relax…..
Now, that I was on Nicholas’ side…. I had the opportunity to transport Nicholas and friends to Namuliika’s church in Masaka. They have a very interesting custom regarding how they let the members of the bride’s church know about the upcoming wedding. Nicholas and his best man in a very slow processional walk in time to the music move up and down the church aisles as if looking for Namuliika. Nicholas is carrying some bright red plastic flowers. When he finally stands in front of Namuliika and hands her the flowers, the church erupted in screams and cheers. In Uganda, the bride’s family pays for the Introduction. The wedding is paid for by the groom’s family along with friends of the bride and groom. A comprehensive list is created for a wedding with proposed costs…. 10 cases of soda at 18,000 shillings, cakes at 300,000 shillings, two wedding rings at 80,000 shilling, rental of groom’s clothes at 100,000 shillings and decorations at 200,000 shillings and the list goes on. In Uganda nurses and teachers makes a fair salary of between $150 and $250 per month. A wedding can cost between 10 and 20 million shillings or $4,000 to $8,000. In the past year, I have been given many wedding list. I am always shocked at the total expected cost.… I wonder why they have to spend massive amounts of money on a single event and go into debt to accomplish their “perfect” wedding day. Does this sound familiar!!!!!! The Introduction was to start at 2 pm on April 5. I arrived back into Masaka late the evening of April 4th. I was tired but excited about the events of the next two days. Since I was part of Nicholas’ side….I had to wait for them to arrive from Kibaale. Once everyone was present we were paraded into the center of Namuliika’s family front yard which was covered with three large white tents. One tent was for her family, one of her guests and one for the family and friends of Nicholas. I was given a front row seat.…… Margaret, our Ugandan accountant moved from Namuliika’s side to sit beside me and support me. She told me what was going on, translated some of the dialogue, told me what to do and when. I wish I was capable of giving you every detail of each different set of costumes. They were very elaborate and looked like something you might see at an India wedding. It was exciting. I was part of a real live play. I was part of the first chapters of Namuliika and Nicholas life together. I had met Namuliika’s grandmother a few times and we connected in spite of the language barrier. She was seated in the tent opposite to the one I was seated in. I kept thinking that I should stand up, walk over and greet her….but I did not know if my actions would be appropriate. Just a few minutes after these thoughts, Namuliika’s grandmother stood up, walked over to me and gave me a great big hug. It was clear that we both we very happy over this event and the wedding the next day. We both love Namuliika. One of the final activities at an Introduction is the presenting of gifts to the bride and her family from the groom’s side. The men get to bring in the chicken, the cow, the suitcases, and bags of rice, maize and flour. The women (me included) get to transport the various gifts of fruits and vegetables wrapped up in small baskets. These are ceremonially paraded in atop our heads. Yes, I carried a basket on top of my head holding on it with both my hands. I followed the other women and we walked in rhythm to the music. It was great fun and I was cheered on by Namuliika’s family. The Introduction lasted over 6 hours…. It was a long day for me and I was exhausted. And now we all had to travel to Kibaale for the wedding the next day at noon. Early the next morning…. I picked up Namuliika’s aunts, her grandmother and 11 wedding cakes and transported them to Kibaale. This was going to be there first time in Kibaale. As the wedding was going on my vehicle was being decorated…. I was told just before the happy couple left the church that I was to drive them back to the reception. But first, I was to follow the other vehicles down the main dirt road of Kibaale honking my horn and driving in a zigzag formation back and forth from one side of the road to the other. You try doing that…..honk the horn in a certain rhythm while turning the wheel at the same time!!!!!!! I was challenged. The community centre would not be my first choice for a reception. It is great for school events. However, my friend David has an ability to turn something ugly into something warm, inviting and beautiful. He took the bridal colours of white and hot pink and dramatically draped them in such a way that the community centre was completely transformed. He was a miracle worker. The reception in many ways was similar to those in Canada but the order was different. The guests and family of Namuliika and Nicholas were feed separately prior to the start of the reception. The first order of business was the cutting of the cake. Once the cake is cut…. Then there is the acknowledgement of individuals the bride and groom which to honour. A cake is given out to these individuals; one cake at a time. The person who receives a cake can take then stand up and give a speech. Namuliika’s sister and her grandmother, Nicholas’ sister and brother, Pastor Eric each received a cake and each of them had something encouraging and supportive to say. The music started and the bride and groom along with the various members of the wedding party got up and danced. It was a lovely evening. I was very proud to be part of a Ugandan wedding; to celebrate the union of two special people. I pray that theirs will be an everlasting marriage built upon respect and love for each other. I arrived in Uganda on January 10, 2012 and was given a 3 months visitor’s visa. I would need a work permit to live and volunteer my services to Kibaale Community Centre Clinic. So, in late February, I completed the first set of documents with my job description being that of a clinic consultant. Unfortunately, our man on the ground in Kampala “Smith” did not think he would have enough time to complete the process. So, on March 10, Karl and I went into a government office in Masaka. After waiting sometime, I requested a six month extension on my visitor’s visa. I showed the government official my airline ticket with a flight leaving the middle of August…. The government official was very kind and very understanding but told me that he could only grant me a three month extension which would be good until June and I would need to re-book my airline ticket….. In June there was no progress, so “Smith” applied for a special pass. It is basically an extension giving the government time to complete the necessary paperwork. What surprised me ….it is a handwritten comment in my passport allowing me to stay in the country for 3 additional months. This gave “Smith” until October 8; I had time to go back to Canada for the month of August to deal with some issues.. I was able to re-enter Uganda easily. On October 6, I received a call to say that my work permit was denied. The government recommended that my application be changed from that of a clinic consultant to that of a nurse. Another special pass was granted valid until middle of December. So, I set off with the help of my friends in Canada to find the necessary documents. I did not think that my application to work as a nurse was the right thing to do since I was not going to work or practice nursing. There are many qualified Ugandans nurses and clinic officers. I came to help put the clinic back on its feet… to organize the running of the clinic, to support, encourage and facilitate the care of the students, staff and community. “Smith” told me that the application for a nurse was quick and easy…. I did not believe him. The days rolled by and I wait for any information from “Smith” but he had no answers. Now it is the middle of December. Another special pass was granted with an expiry date of March 6, 2013…. We were strongly encouraged to change the man in Kampala. “Peter” was hired. In late January “Peter” reviewed my application. My new job description was that of a volunteer. As always, time was against my application. I was strongly encouraged to go on vacation, a trip out of Uganda for at least 5 days before March 6th so that on my return I could get a 3 month visitor’s visa. It takes time and preparation to leave the clinic. I had been planning a trip to see more of Uganda with some friends but this plan had to be canceled and the time used for the trip out of Uganda. The internet in Kibaale is poor at the best of times. I tried to search various places in other countries of Africa I would love to visit….. but I was never able to open any Google hits. Each time I tried the whole thing closed down….. I asked my friends in Masaka to help find me a trip. Ken and Carina looked for a trip where all of us could enjoy an inexpensive holiday but they were unsuccessful. So early Sunday morning February 17, I left Kibaale. I was on vacation for 10 days but had no place to go. No airlines tickets had been purchased. No accommodation booked…. I had no plans in place. I had no idea where I was going but I had two full suitcases. A normal trip into Masaka takes about 1.5 to 2 hours but not this day. The road from Kibaale to Ssanje was blocked. My land cruiser was checked inside and out at least three separate times by police. My documents are requested three times….. and I got to sit on the side of the road and wait and wait and wait. I was finally informed that the President of Uganda was visiting the village. Only after his motorcade had arrived in the village was I allowed to proceed. As a result, I arrived in Masaka at 3 pm. I had no idea what to do… I was frantic…. It is challenging to purchase tickets and book accommodation months in Africa. I was absolutely sure that there were no special late minute deals for trip or vacations in Africa. Arleen saw me coming up the stairs at the Timothy Centre and came to my rescue. She is familiar with many vacation destinations in Africa. We tried flights to many of her favourite places such as Capetown, South Africa but no flights were available. Finally, Arleen suggested Zanzibar, Tanzania. Due to the limited availability of flights I was only able to go for 5 days. It was something. Accommodation was the next big problem. Every resort she had used in the pass was booked…… finally we booked a new resort highly recommended TripAdvisor. On Monday, I traveled to Entebbe for a flight leaving early Tuesday morning. I missed the flight; I set my alarm clock incorrectly. I arrived at the airport 30 minutes prior to departure and was denied entrance. I burst into tears….. I cried. This whole idea of a vacation was getting more and more absurd. This did not feel like a vacation but rather an obstacle course or was it the “Amazing race”?????? I was told that I would have to purchase another ticket if I was planning on traveling to Zanzibar that day. I purchased a second ticket landing in Zanzibar at sunset.. I was going to travel the roads of Zanzibar in a taxi after dark. My beach-side accommodation was an 1.5 hour trip at a cost of $70 US. I just had to barter the price down to $50 US. A very tall, toothless, grey haired local was my driver. Within five minutes of leaving the airport, he stopped, screamed something at me and left me alone in his old, doors do not lock, windows do not close taxi. He returned with a large cup of oil. After putting in the oi, we headed for the gas station. For the next hour, I listened to him justify why he should be paid $70; the cost of gas, his childrens’ education, the car needed repairs, his wife was sick, he was getting old at 59 and wanted to retire. I did not want to hear his story. I truly wondered if any of it was true. Would I arrive at the resort? I prayed. He frequently stopped to ask directions. At one point, he stopped in the middle of the road, pulled out a flashlight and loudly proclaimed “you will not sleep in taxi tonight.” Minutes later we arrived. One of the good things about this resort was they accepted MasterCard. I had very little US cash….. I was kindly informed that the credit card machine had been broken for months and was expected to pay cash. It was not an all inclusive resort. You paid for your accommodation with meals separate. They were expensive. I stayed that night. The next morning, I discovered two things; they had internet and many of the other guests had tried to find other accommodation without success. We were all in the same boat. There was no gift shop, no resorts or restaurants in the area. The snack bar was for alcoholic drinks only but they had a espresso machine. So, I relaxed and soaked up the sun, walked the beautiful white sandy beaches, swam in the warm turquoise blue Indian Ocean, enjoyed great cups of coffee and read numerous books from my iPad. At midnight, I arrived back in Uganda. The purpose of this “forced” vacation was to get a three month visitors visa but the Immigration officer checked my passport and found a valid special pass. No visitor’s visa was granted. I very politely requested a visitor’s visa but she motioned for the next person. I stood dumbfounded. It is March 7, 2013; it has been over a year since I first applied for a work permit…… “Peter” got me another special pass. This was to be my final one, my last one…. I must get a work permit before May 6, 2013. It is April 4th, I have just returned from Kenya. Once again, special pass accepted; request for visitor’s visa denied. It seems that nothing is going right with my work permit. Everything we try fails…. I am thinking about what is next when “Peter” calls. I am told that the NGOs have approved my work permit. The NGOs type up their approval and this letter is sent to Immigration. It will take about 3 weeks but usually Immigration accepts the NGOs recommendations. I am finally going to get my work permit. In the beginning, I was anxious. Everyone I knew had a permit. I prayed and prayed. I asked for prayers….. Then sometime around the early part of January 2013…..I started waking up frequently singing an old hymn or chorus…”trust and obey, for there is no other way to be happy in Jesus but to trust and obey”. Even after it was confirmed I had a work permit coming, I still woke up with this song on my heart. I did not know why but I came to a place where I was willing to stay, live and work in Kibaale or go back to Canada. I wanted to trust that Father God knew what was best for me and for the clinic in Kibaale. I would obey his decision. On April 17, I was working hard to finally complete this blog. I was still living and working in Kibaale. I was expecting a work permit any day. On April 18, “Peter” called to tell me that my work permit was denied, there were going to be no special passes and I would have to leave the country by May 6. To say I was shocked was an understatement. I had just over two weeks to hand over the clinic, pack my suitcases and leave Uganda, leave Kibaale. Would I be able to complete the tasks!!!!!! That next Monday, I headed to Kampala to purchase a computer for the clinic and a few other essentials. I did not do any buying but under the direction of “Peter” spent the day going from one government office to another alone asking why I was denied a work permit. After seven hours of sarcastic comments, I learned that the process for my work permit had been poorly managed right from the beginning. Everything that I have written is wrong. Did you read that correctly….. Yes, everything that I have written above about my work permit is incorrect. I have never had a work permit nor have I had a denial. The first application is still in progress…. the committee had a number of questions which they are waiting an answer. The progress stopped in early June of 2012. A letter answering the questions plus a document from a government official in Rakai district is requested. It has been sent….. It is May 7 and I have left the country of Uganda…. I am on vacation heading back to Canada in a few days. I handed the clinic into the very capable hands of the Ugandans. I packed suitcases…. one of gifts, one for vacations and traveling back to Canada and one for “if” I return to Kibaale I will have clothes to wear. I still do not have a work permit and who knows if and when I will get one….. GOD KNOWS!!!!! Ezra, is the 3 year old son of the Pastor Eric and Peace. Almost everyday, as I walk to the clinic I pass Peace and Ezra walking towards me on their way to daycare. Ezra always gave me a wave and a big smile. Sometimes I wondered if he was saying “Hello” or was it “Goodbye”. In January, Pastor Eric, Kibaale Community Centre Chaplain came and told me that Ezra was taken to Masaka Regional Hospital to be seen by a dentist. He had a toothache. The tooth was pulled. A few weeks later, Eric brought Ezra to the clinic because his eyes were not focusing. He was not able to follow an object, turn his head towards the person who was speaking. In fact, his head was slightly turned to one side. After discussions with the Clinic Officers and comprehensive nurse, Ezra was referred to Masaka Regional Hospital two hours north of Kibaale to see an eye specialist. Masaka recommended a doctor in Mbarara two hours west of Masaka. This specialist stated that with time, the boy would be fine. He gave them vitamins and suggested they come back a few months. Then a few weeks after the problem with his eyes, Ezra was not able to walk, nor to stand. His arms and legs did not move normally. He was too weak to move on his own. These new symptoms brought us to the realization that he needed to be seen by a neurologist, a brain specialist. He would have to travel to Kampala to the government hospital called Mulago. The clinic staff knew no one in Mulago Hospital. It took a few hours to find a neurologist, learn that he would be in his office the next day and that he would see Ezra. Immediately, the specialist recommended a CT scan. Unfortunately, the contrast needed to visualize the brain was not available. Eric was not willing to wait. He searched out a private hospital called Kampala Private Hospital. He found the Professor, an neurologist. A CT scan was taken. The cost of a visit to the private neurologist, tests, CT scan and treatment for three days was extremely expensive. Kibaale Community Centre clinic referred Ezra, therefore, the bills would be paid. After reviewing the CT scan, the Professor stated that Ezra had a lesion which he thought was some type of infection or T.B. (tuberculosis).The family was finally sent home after a few days in hospital on intravenous antibiotics and anti-tuberculosis drugs. The Professor wanted to see them again the next Saturday. Of course, they were sent home with lots of medications. Now, it is a long way from Kibaale to Kampala. If you take the morning bus which leaves Kibaale at 4 am you will arrive in Kampala by 10 am. It is somewhat expensive. A cheaper method is to take small buses which stop frequently. The drive wants to make the most money so he stuffs his vehicle with as many people as he possible. That next Saturday, Eric and Peace carefully carried their son from Kibaale to Kampala through all the hazards of Uganda travel to see the Professor. He was somewhat pleased with the way the treatment was going and send them home on the same medications. He wanted to see them one more time that next Saturday. It was an significant challenge to travel with Ezra and everything else back and forth from Kibaale to Kampala. Was it necessary? If Ezra was not getting worse could they wait a week before traveling back to Kampala? On Wednesday afternoon, Eric and Peace along with Ezra visited the clinic. Ezra was not getting worse but was also not getting better. The clinic staff called and spoke with the Professor who recommended another visit. Early Saturday morning, Eric and Peace took Ezra once again to Kampala Hospital. Once the Professor saw Ezra he recommended another CT scan…. The results were not good. The lesion had increases significantly. It was not TB and it was not an infection. Whatever the cause of the lesion, it was obstructing the flow of cerebral fluids. Neurosurgery, an operation of the brain would need to be done immediately. The plan was for surgery early Monday morning but since Eric and Peace did not have the funds for the surgery to be done at this private hospital, Ezra was moved to the government hospital, Mulago. It was just after midnight when Ezra was finally admitted and but into a bed. He had the same neurosurgeon. It seems that many of the specialist cannot survive working just for the government. The Professor worked in Kampala private Hospital and he was the head of the neurosurgery department in Mulago government Hospital. Ezra appeared to be in good hands. It was 2 am when I got the call from Pastor Eric to tell me that Ezra had died. I have never gone to a funeral. I have avoided them. I guess because the first time I was intending to go, someone told me that as the only “mzungu” white person it was expected that I give a speech. I was planning on going to Ezra’s funeral. I wanted to support Eric a loving father, a great pastor, an amazing chaplain as well as Peace, a gentle and loving mother, a kind and thoughtful woman of God. Once the informal funeral service was over, the majority of the people walked down the road to an unkempt field. It did not appear to be a cemetery; there were no grave markers. It was a humble piece of land covered with prickly shrubs. At the far end of the open patch was a small hole in the ground. As I approached the site…. singing broke out and everyone joined in. It was hard for me to see exactly what was happening…. but during the fourth or fifth song, the small body of Ezra was placed into the ground. Screams erupted. Loud sobs exploded across the 500 plus people. Singing continued as the body was put into the ground and slowly covered with earth; many of the men took turns. The local pastor completed the burial with a simple prayer and a benediction.